“Why we eat what we eat.” That’s the mantra of American Food Roots, an online project dedicated to uncovering America’s culinary roots. 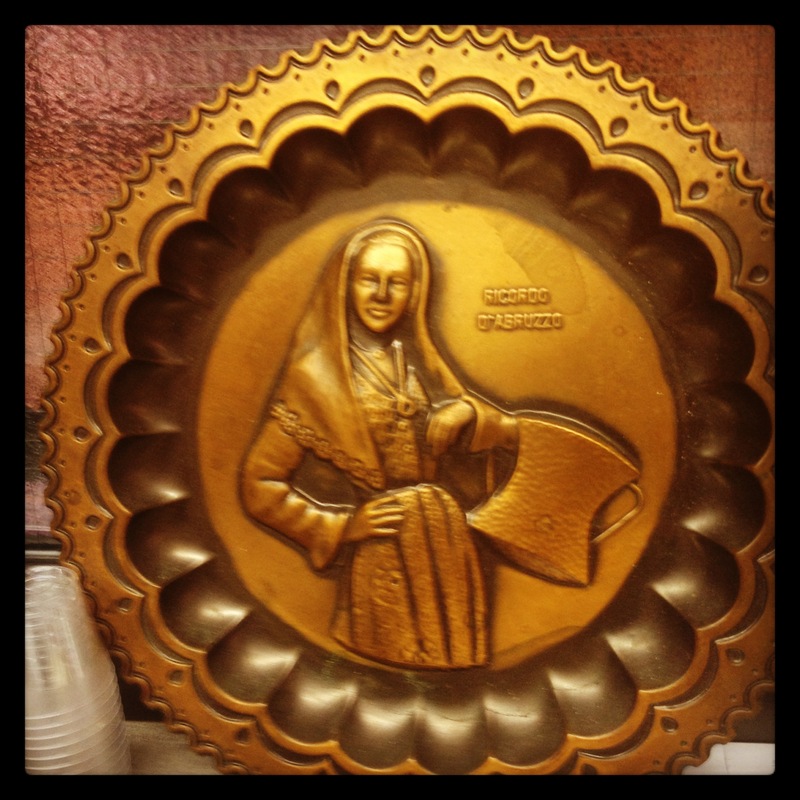 The AFR website states, “Through food, we celebrate our heritage – regional, religious, ethnic, political, familial. We cook and eat to connect with family and friends, as well as with ancestors we never knew.” American Food Roots is led by four talented and experienced journalists whose mission is to share recipes and stories about America’s culinary traditions through articles, interviews, photos, videos and other media outlets. A few months ago, my friend Helen Free, author of the blog, Hang on to the Vine and one of the co-organizers of the Let’s Blog Abruzzo conference I’m attending in June, urged me to join the AFR community and introduced me to her friend, Italian cookbook author Domenica Marchetti. Since becoming an AFR community member, I have learned about: using a wok to make sausage and peppers; the Easter food customs of a Moravian-American community in North Carolina; the 500-year history of fusion cuisine in Florida; the beauty of using heirloom cooking tools to recreate old family recipes and so much more. 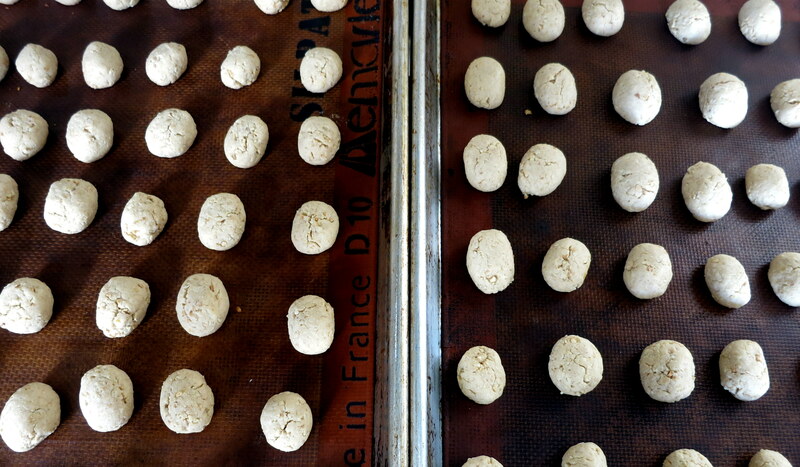 Domenica and the the AFR team gave me the opportunity to contribute to American Food Roots with a story about my father’s Italian social club in Queens, New York and the men who cook there. 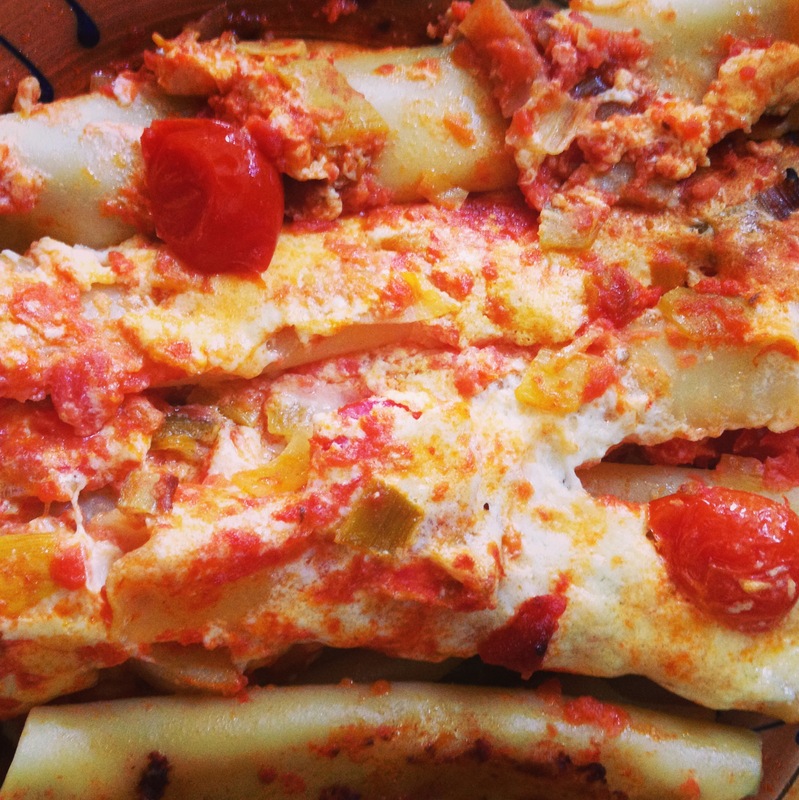 The article also features a recipe for plangozze al sugo, a rustic and hearty homemade pasta dish from Abruzzo. Happy reading and buon appetito! 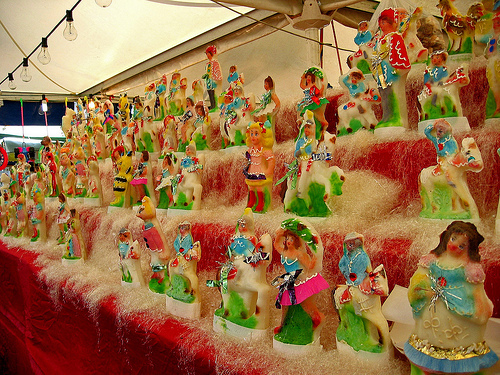 Candele from Pastificio Faella in Gragnano, a town south of Naples and purportedly the birthplace of dried pasta-making. 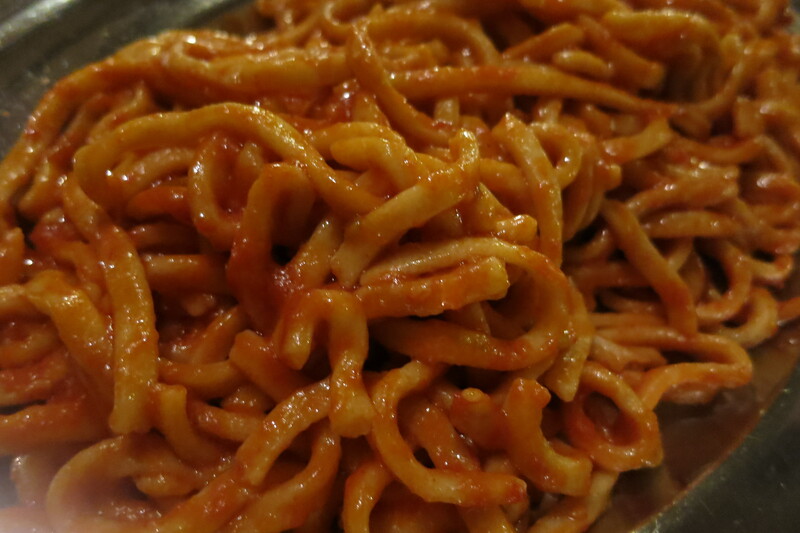 Pasta from Gragnano was awarded IGP status in 2010. Last week, I ventured across the bridge to visit the Bronx warehouse of Gustiamo, a purveyor of artisanal Italian foods sourced from small producers that continue to stay true to traditional methods. 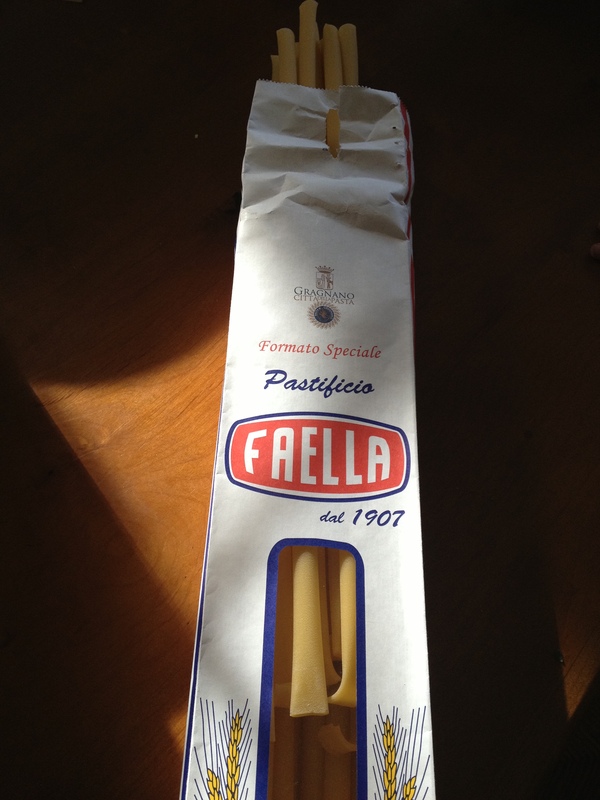 I purchased several bottles of new harvest extra virgin olive oil and a rather intriguing package of 21-inch candele pasta produced by Pastificio Faella, a family business that has been making pasta since 1907. Candele, named for the long, thin white candles once used in liturgical processions in Southern Italy, are extruded through bronze dies and dried for a whopping 60 hours at a very low temperature. 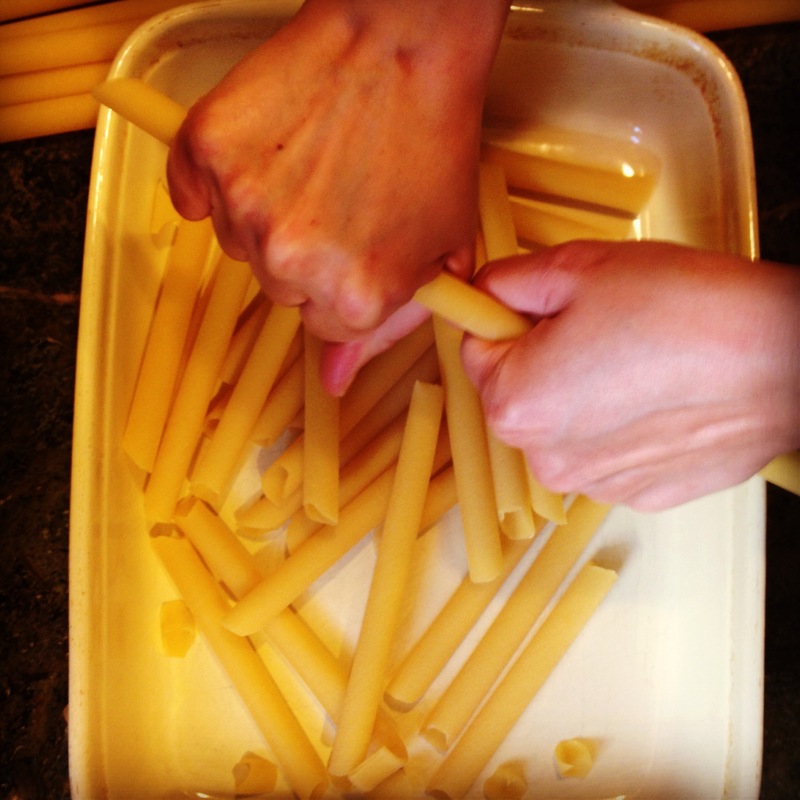 Prior to the emergence of modern machinery that facilitated the cutting of smaller shapes, all tubular and strand pasta, including candele and spaghetti, were left to dry in long forms and broken into smaller pieces prior to cooking. 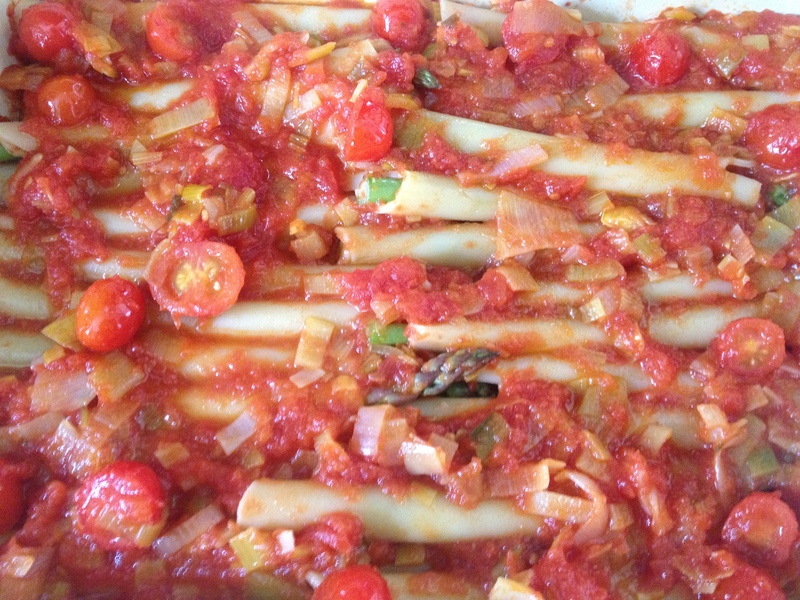 Taking my cue from Prof. De Vita, I foraged my refrigerator and created a baked spring pasticcio (quite literally, a mess) of asparagus, leeks, tomatoes and a blend of cheeses. Buon appetito! Preheat the oven to 375 degrees. Slice leeks in half length-wise and rinse under cold water to remove the grit. Dry with a clean kitchen towel and chop crosswise into 1/2 inch pieces. In a heavy-bottomed pot or deep skillet, heat olive oil over medium-low heat until shimmering. Add leeks and a pinch of salt and stir frequently, until the leeks are soft and caramelized, about 8 minutes or so. Add the tomatoes and a 1/2 teaspoon of salt, raise the heat to high and bring to a boil (slosh the bowl that contained the tomatoes with a half cup or so of water and add to the pot as well). Reduce the heat to medium low and allow to simmer for about 20 minutes, until slightly thickened. Turn off the heat and add salt and pepper to taste. Meanwhile, add the mozzarella and eggs to the bowl of a food processor and pulse until the mixture becomes a creamy paste. While the sauce is simmering, bring a large pot of salted water to a boil. Break each candela into four equal pieces. Add the broken candele to the pot and allow to cook for 5 minutes. (The candele should be very al dente since they will continue to cook in the oven.) Thoroughly drain the pasta and drizzle with a bit of olive oil to prevent them from sticking while you’re assembling the pasticcio. Lightly grease a 9X13 ceramic or metal baking dish with butter or olive oil and ladle enough tomato sauce to coat the bottom. 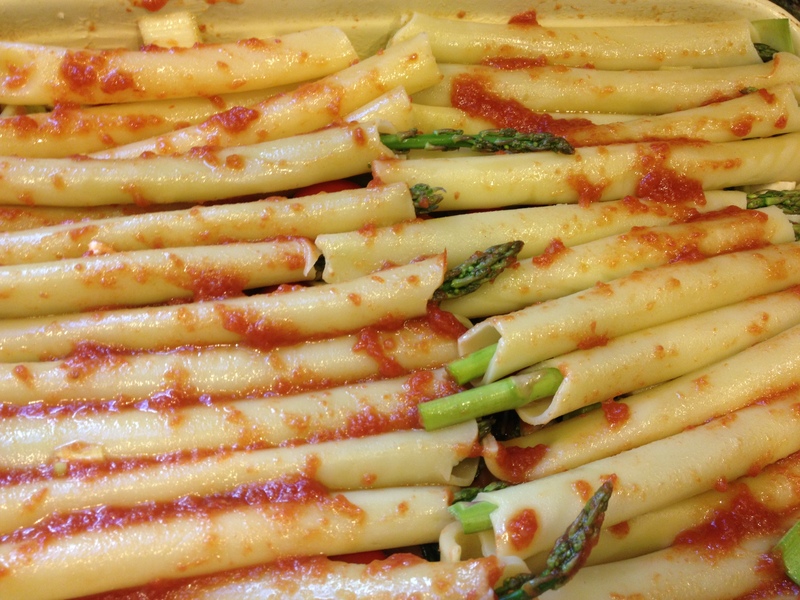 Insert an asparagus stalk in each candela and add the filled candele to the dish in a snug single layer, as pictured below, rolling in the sauce as you go. Ladle additional sauce onto the candele layer until it is covered. Scatter half of the tomatoes and some of torn basil leaves onto the sauce. Next, with a spatula, spread half of the mozzarella cheese mixture evenly over the sauce and sprinkle 1/3 cup of Parmigiano over it. Repeat, layering again, first with the asparagus-filled candele, followed by the tomato sauce, then the tomatoes and basil and then the remaining mozzarella and another 1/3 cup of Parmigiano. Add a final thin layer of sauce and sprinkle the remaining Parmigiano on top. Place the tray in the middle rack of the oven and allow to bake for about 35 minutes or until the cheese is bubbling and the top of the pasticcio forms a nice golden crust. Remove from the oven and let “rest” for about 10 minutes prior to cutting. To serve, cut along the length of the candele, into rectangular servings consisting of two layers of six or so candele . 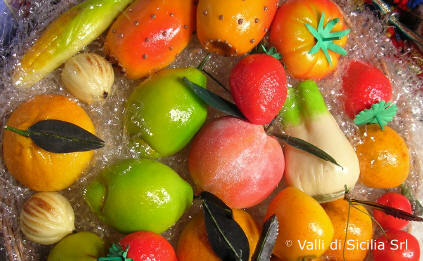 Ordering Information: You can order Faella candele and other exemplary Italian products at http://www.gustiamo.com. 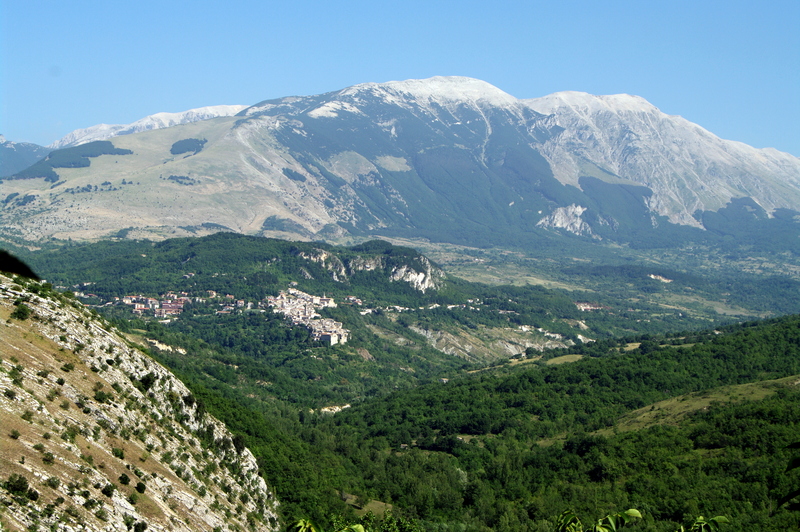 Santo Stefano di Sessanio, host to the Let’s Blog Abruzzo conference that I’m attending in June (www.blogaway.org), is a quaint mountain village in Abruzzo that was largely abandoned when its impoverished inhabitants left in search of work in the years following World War II. In the early 1980s, a Danish developer launched Sextantio Albergo Diffuso, a hotel converted out of historic buildings with the intent of reviving and preserving the remote village and welcoming tourists without sacrificing its physical and cultural identity. The lentil is thought to have arrived in Santo Stefano at the time of the Roman settlement, Sextantia and derives from an old and rare species that is cultivated only in the poor terrain found high in the mountains. These tiny, dark brown legumes are iron-rich and have skins that don’t separate during cooking. 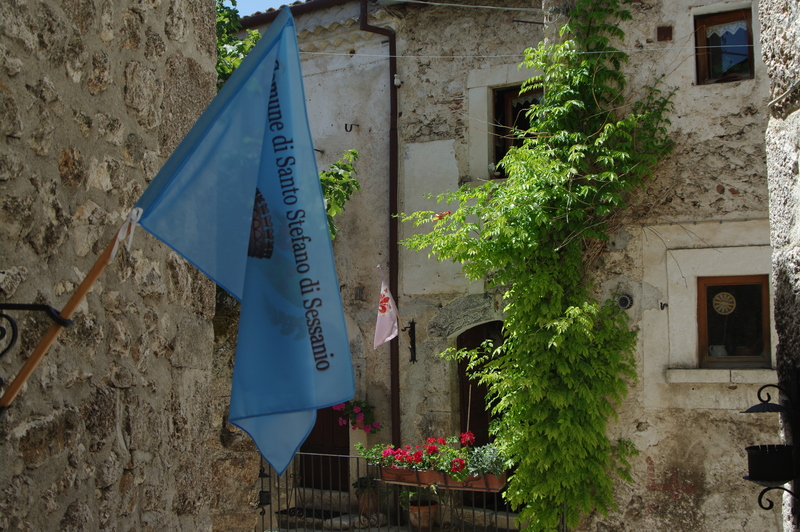 The harvest generally occurs during the last weeks of August and the Sagra delle Lenticchie festival takes place in Santo Stefano every September. 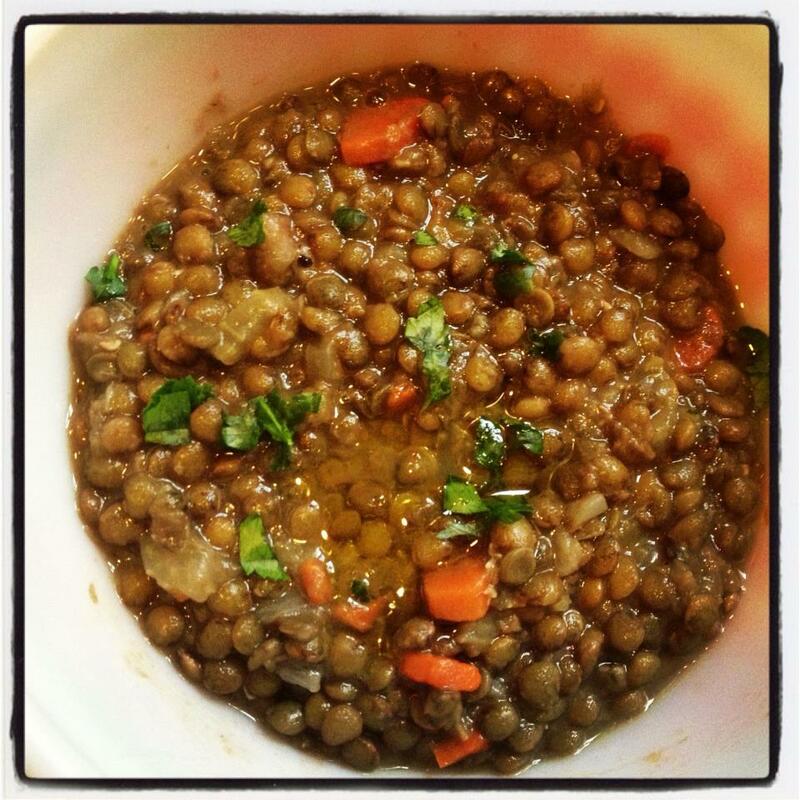 My lentil soup recipe isn’t traditional to Santo Stefano di Sessanio, but is a great vehicle for small lentils. To my knowledge, lenticchie di Santo Stefano aren’t yet widely available outside of Italy, but Castelluccio lentils from Umbria or French Puy lentils are good substitutes. Add two tablespoons of olive oil to a heavy-bottomed stainless steel or enameled cast iron pot and set over medium-low heat until the oil is shimmering. Add the chopped anchovies to the oil, lower the heat and, stirring frequently, allow them to cook until they seem as if they’ve dissolved or become part of the oil. Add the shallots, celery and garlic and sauté until the vegetables become soft and golden (if the anchovies start to seem too “crunchy”, add ¼ cup of water to the mixture). Add the water, bay leaves, additional 2 tablespoons of olive oil, black pepper and the lentils and raise the heat to high. When the water comes to a boil, lower the heat to medium-low and allow to gently simmer for about 20 minutes, stirring occasionally. After 20 minutes, add the carrots and salt and keep simmering for about 15-25 minutes more, tasting as it cooks to check for doneness. If the soup becomes too thick, add water a cup at a time (lentils absorb a lot of water, even after you’ve turned off the heat, so chances are, it will become too thick before it becomes too liquid.) When the lentils taste smooth and creamy, turn off the heat, adjust the salt and pepper, stir in the parsley and drizzle with your best olive oil (see notes below). Buon appetito! 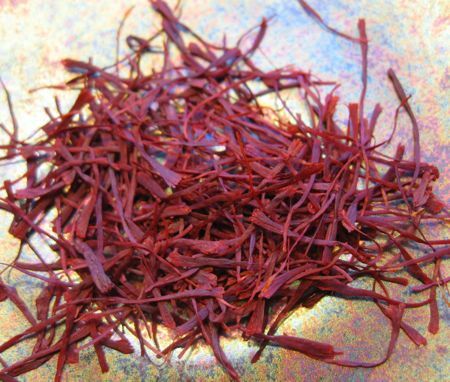 Extra Two Cents: A peppery oil such as La Quagliera from Abruzzo would add a wonderful finishing touch to this rustic soup – http://www.gustiamo.com/cgi-bin/front_end/prodotto?id=76289). Also, homemade olive-oil croutons are a terrific accompaniment to the lentils – simply cut day-old bread into small cubes, drizzle with olive oil and toast in the oven at 375 degrees until they’re crunchy. Preparing Anchovies: Hold the anchovies under cold running water and gently rub off the salt with your fingers. Pat them thoroughly dry with paper towels and transfer them to a cutting board. Using the tip of a sharp paring knife, make a small incision along the side and run your knife along the length of the anchovy. Gently peel back the top portion of the anchovy to reveal the backbone on the bottom portion. With the tip of your knife, gently remove the backbone and cut off the tail. Finely chop the anchovy fillets. 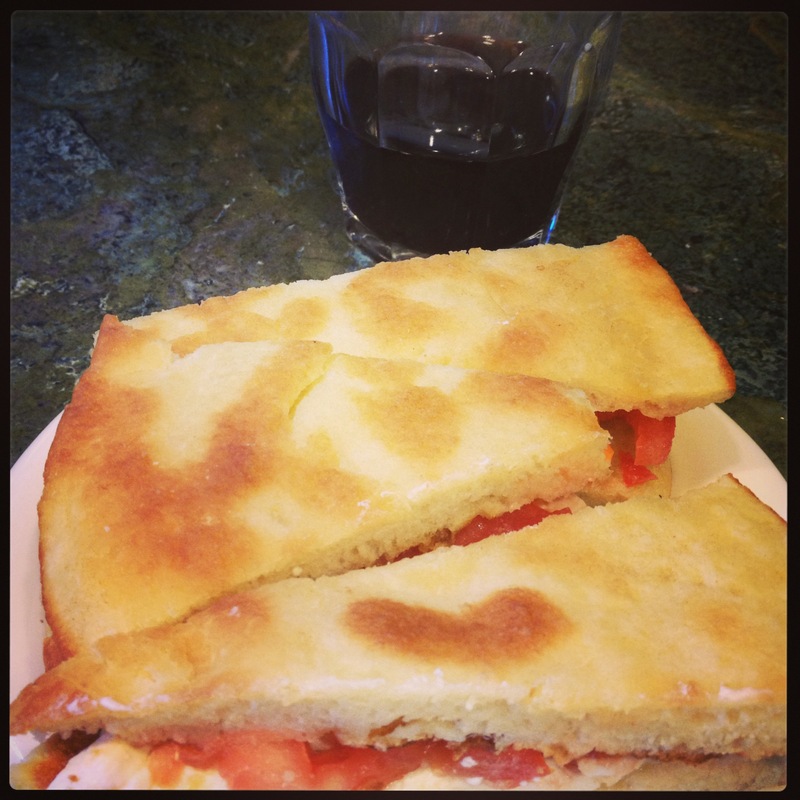 Torta al testo is a traditional flatbread sandwich from Umbria stuffed with vegetables, cheeses and cured meats. 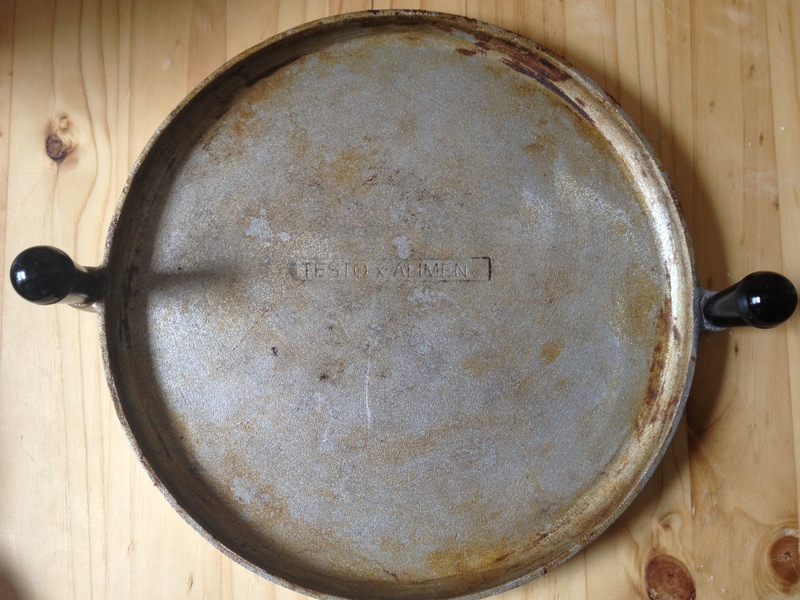 The torta is cooked on a heavy testo, a circular iron griddle placed directly on the stovetop (long ago, the disc was made from clay and placed over coals in the fireplace). When I was a student in Perugia with about 10,000 Lira per day to spend on food (about $5 USD back in the pre-Euro days), I regularly frequented a hole-in-the-wall Forno on a narrow cobblestone street near the university that specialized in this savory regional specialty. Each day after classes, I ordered a torta al testo for lunch and brought it up to Corso Vanucci, the wide pedestrian-only promenade in the centro storico that was ideal for people-watching. 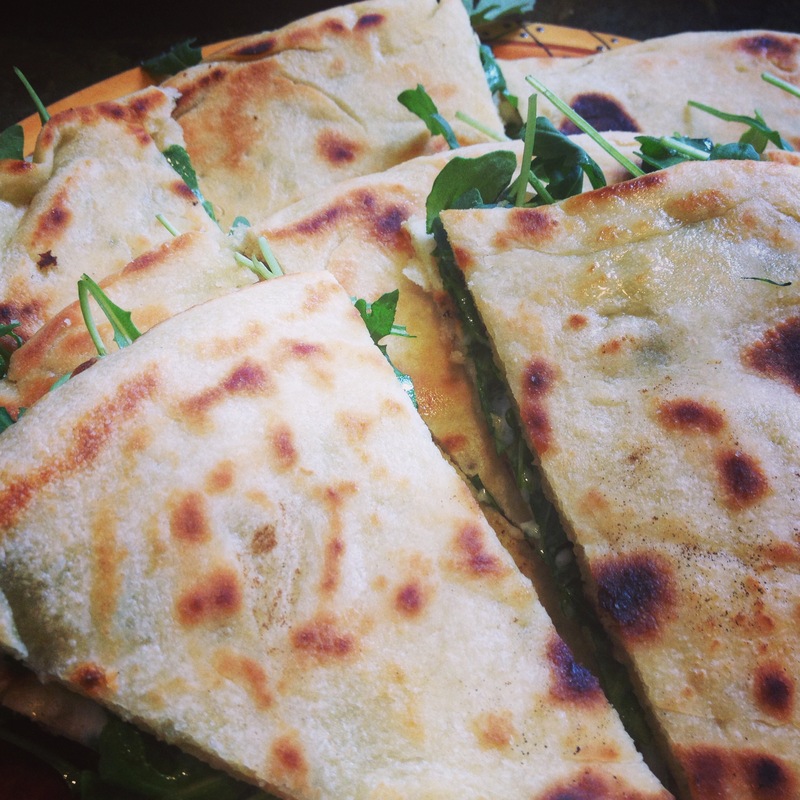 My favorite filling for these fluffy, oiled flatbreads was peppery arugula , sweet pacchino tomatoes and creamy stracchino cheese. Last summer, during a mini-break from Abruzzo, we visited Umbria, and I returned to Perugia for the first time since 1997. I dragged my husband and three sons around the maze of backstreets behind the university for nearly half hour in search of my beloved Forno. 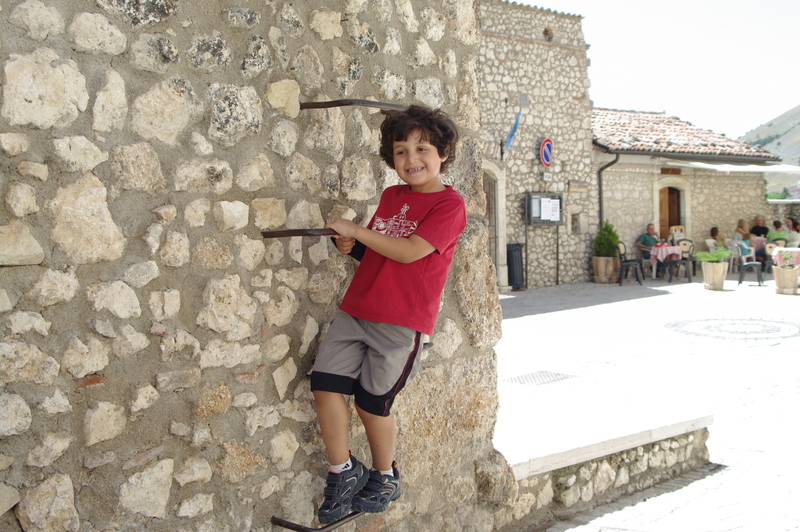 I resigned myself to the fact that I wouldn’t find my old haunt, picked up some pizza al taglio for my hungry kids and set off for Gubbio, where we were staying for a few days. The next day, as we were exploring the lovely medieval town, I asked a local shopkeeper from whom I purchased a testo (called a panaro in Gubbio) where we could enjoy a good torta al testo (which, incidentally, is called crescia in Gubbio) for lunch. They sent us to Osteria dei Re, a charming osteria and wine bar with al fresco dining in a picturesque piazza, where we were treated to the torta al testo of my memories. Here’s an easy recipe that you can prepare in your favorite well-seasoned cast-iron skillet. 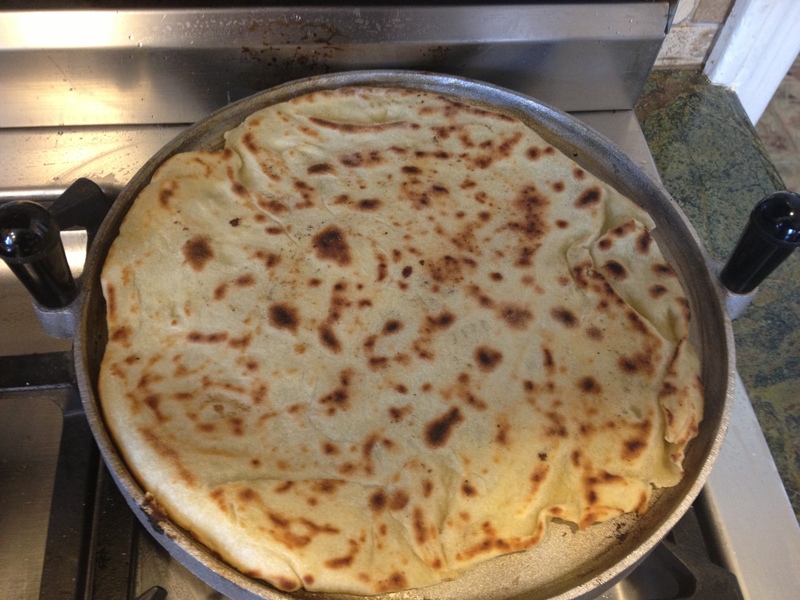 Prepare the dough in the morning and enjoy them for lunch or refrigerate the dough overnight and simply bring it to room temperature prior to griddling the flatbreads (the uncooked dough stays very well – How do I know this? Because I was in the process of making the flatbreads for a play-date luncheon when my five-year old broke his collarbone! 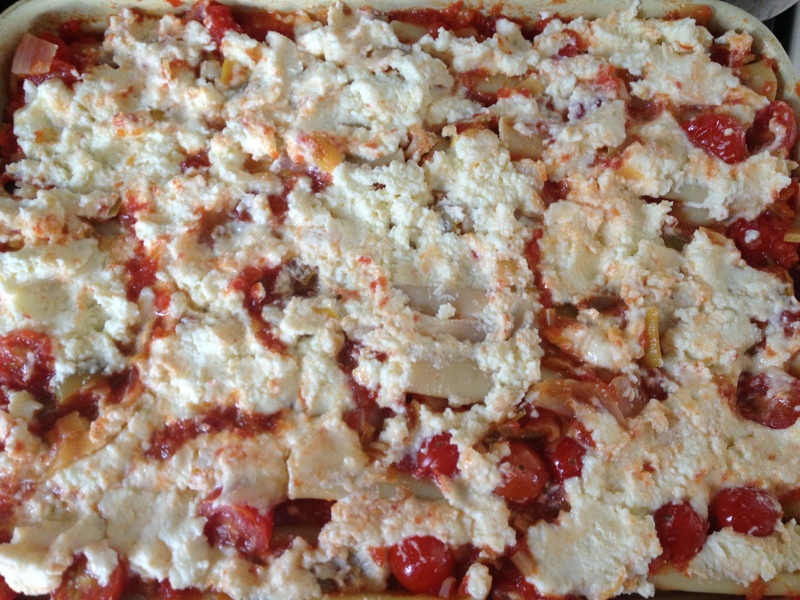 The remainder of the dough went in the fridge and I prepared it the following day with his favorite filling of fresh mozzarella and tomatoes!). Once griddled, the flatbreads should be enjoyed very soon after you prepare them. They tend to become stale rather quickly. If you need to wait, wrap them tightly in plastic after they cool off and reheat in a whole oven prior to serving and filling. When this crazy Northeast weather finally warms up, I’ll try to cook them on the stone piastra I have for my outdoor grill. In a small bowl, stir together yeast and ½ cup of hot water. Let it sit until foamy, about 10 minutes. 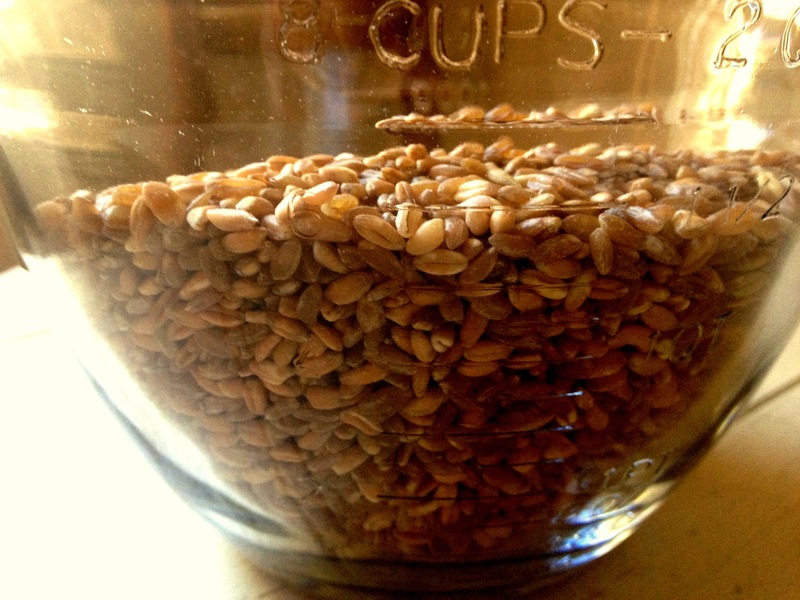 Combine flour and salt in a food processor and pulse to combine. 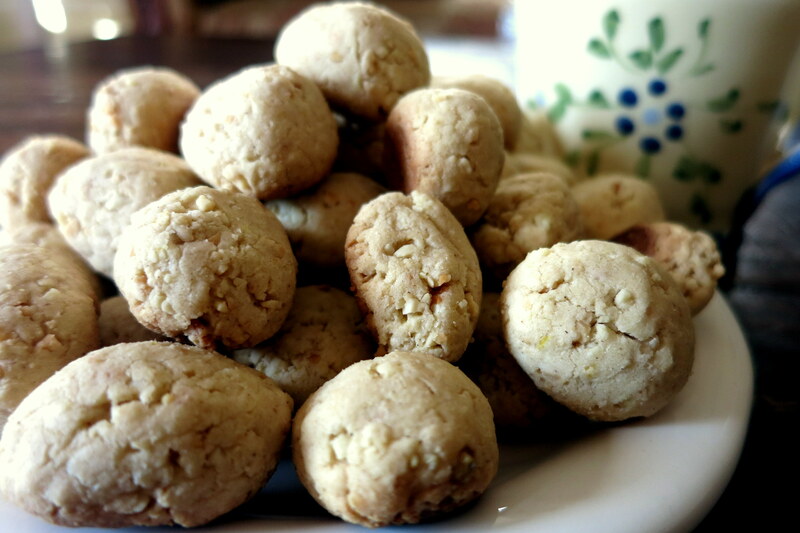 Stir 1 tablespoon of olive oil into the activated yeast mixture and with the food processor running, pour it in. Process until a dough forms (i.e., when the ingredients no longer adhere to the sides of the bowl – if the dough is too dry, add some additional cool water, one tablespoon at a time until this happens). Transfer the dough to a lightly floured surface and knead for about 5 minutes. 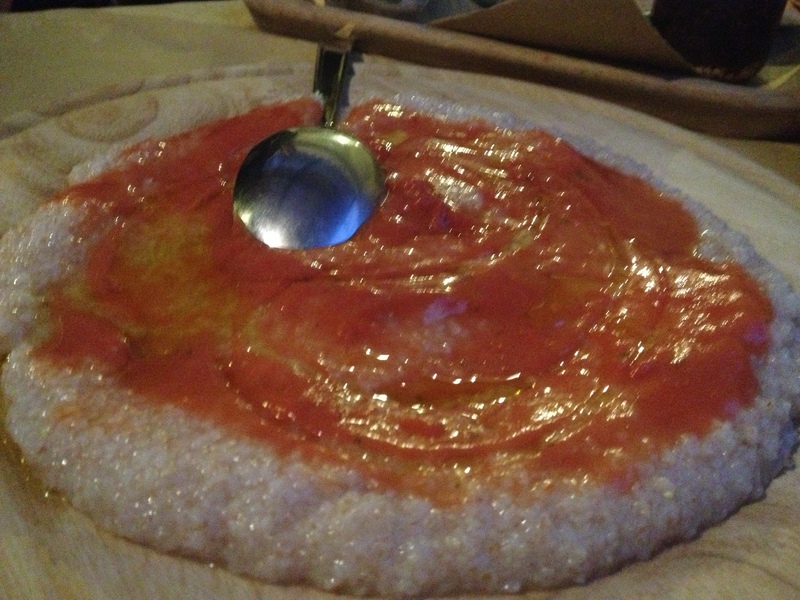 Form the dough into a ball and transfer to a large oiled bowl. Cover the bowl tightly with plastic wrap and allow the dough to rise for about 1½ hours in a warm place. 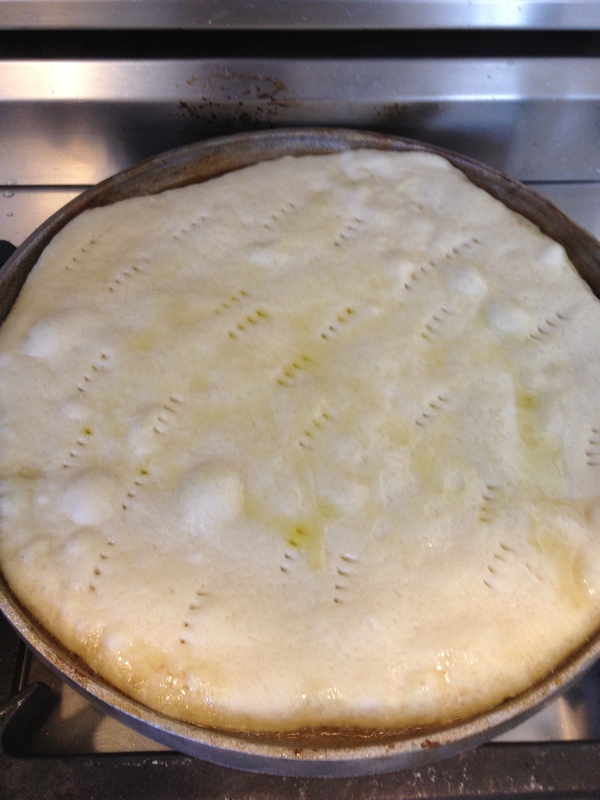 Punch the dough down (the dough should have doubled in size) and divide it into two balls. 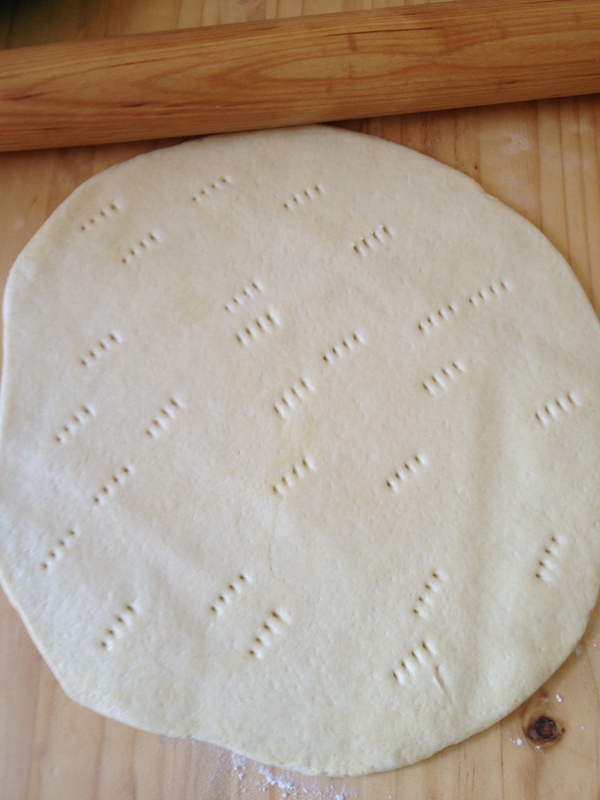 Lightly flour one piece of dough and, using a rolling pin, roll it into a 9″ disc. Place the disc on a floured baking sheet, poke it all around with a fork (this will prevent too many air bubbles during cooking) and repeat with the remaining dough. Heat one tablespoon of olive oil in a 10-12″ cast-iron skillet over medium heat. Working in 2 batches, cook each dough disc, flipping occasionally, until light brown on each side, about 8-10 minutes total. Lay one of the flatbreads on a cutting board, add your desired filling, place the other flatbread on top, and with a serrated knife, cut the torta into 8 wedges. Drizzle with a little bit more oil and serve. A few years ago, I enjoyed an incredible pranzo at the lovely Ristorante Nino in Chieti, a small city perched on a hilltop between the mountains and sea. The highlight of my lunch was a riff on the Abruzzese classic, Spaghetti all’Aquilana, a regional specialty which prominently features prized Zafferano Dell’Aquila from Navelli, as well as zucchini and its blossoms. The addition of raw egg yolks and grated cheese at the end of cooking produces a rich yet delicate sauce that beautifully coats the pasta (this technique is found in many dishes in the Central Italian regions of Abruzzo, Le Marche and Lazio). Nino’s version also included crumbled sausage, which gave the dish a rusticity that is perfect for home cooks who wish to serve a hearty pasta dish as a piatto unico for dinner. My take on the recipe is set forth below. Buon appetito! Bring a large pot of salted water to a boil. In a wide sauté pan, add one tablespoon of olive oil over medium heat until shimmering. Add the sausage and break up any large pieces with the back of a wooden spoon, stirring frequently to prevent sticking. When the sausage is browned, about 6-8 minutes, using a slotted spoon, remove sausage, to a bowl. Add the other tablespoon of olive oil, lower heat to medium low, and add the shallots to the pan, along with ½ teaspoon of salt, stirring often. Cook for about 4 minutes, or until the shallots are golden, then add the zucchini, season with a large pinch of salt and a few grinds of pepper and raise the heat to medium-high. 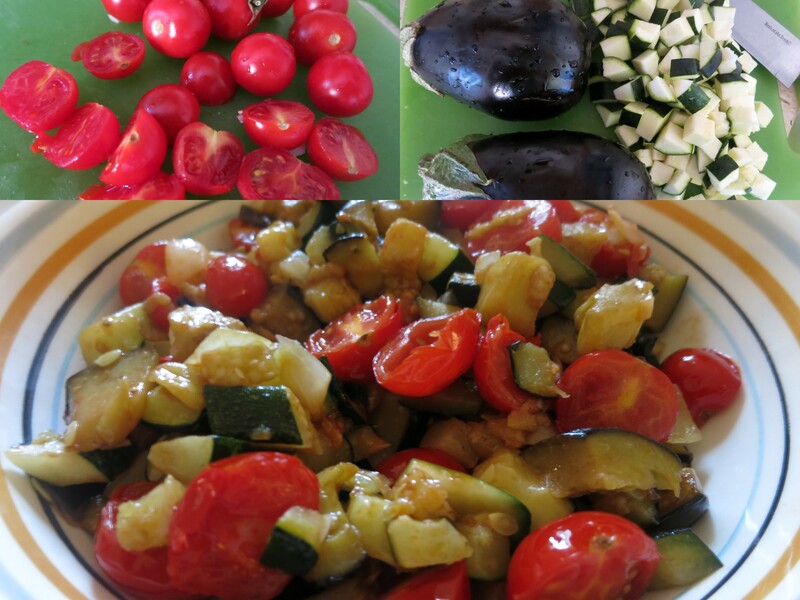 Stir frequently and cook until the liquid released by the zucchini has evaporated. Add the reserved sausage and its accumulated juices to the zucchini as well as the white wine and turn the heat up to high, stirring often, until the wine has evaporated. Add the saffron-infused water and allow to simmer on medium-low heat until the liquid has reduced by about half. Turn the heat down to low until the pasta is ready. Meanwhile, add the pasta to the pot of boiling water and cook according to package instructions minus one minute. 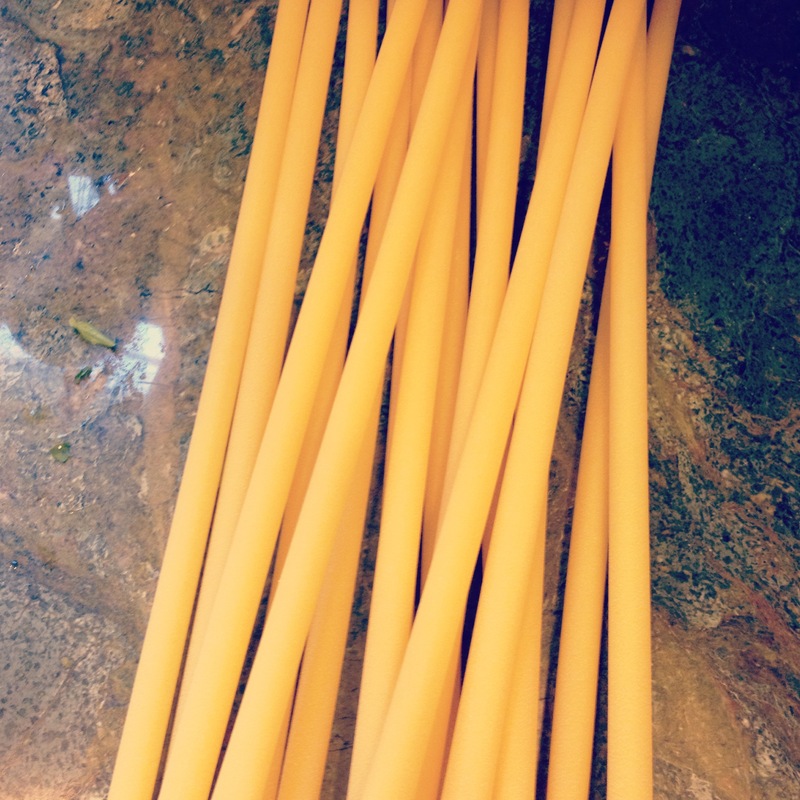 While the pasta is cooking, add 1/2 cup of pasta cooking water to the egg yolk-and-cheese mixture and whisk rapidly. Set aside. 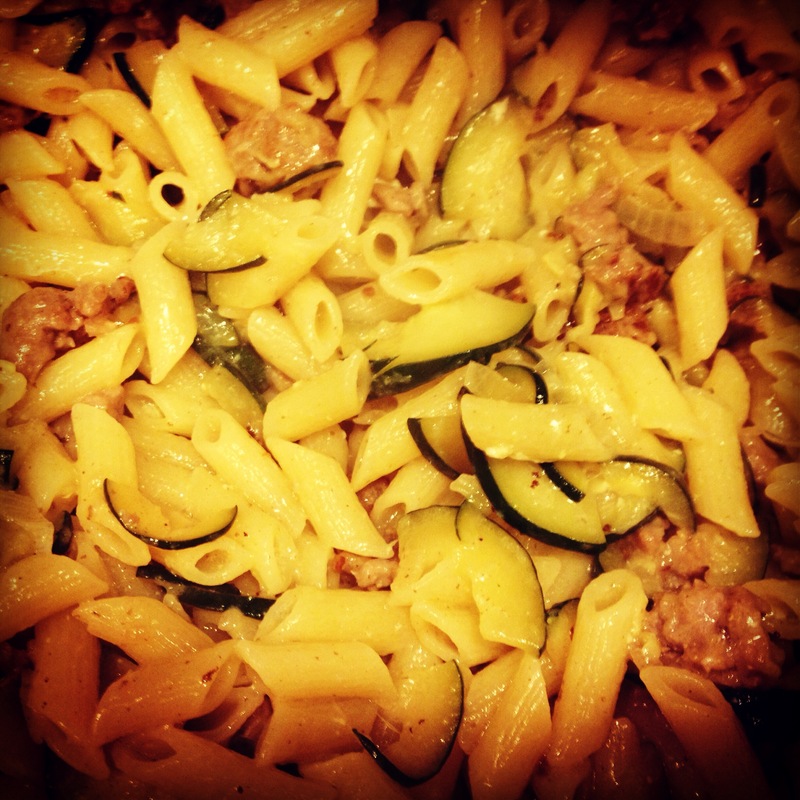 Drain the pasta, reserving ½ cup of pasta cooking water, and add both the pasta and reserved water to the zucchini and sausage mixture and stir well. 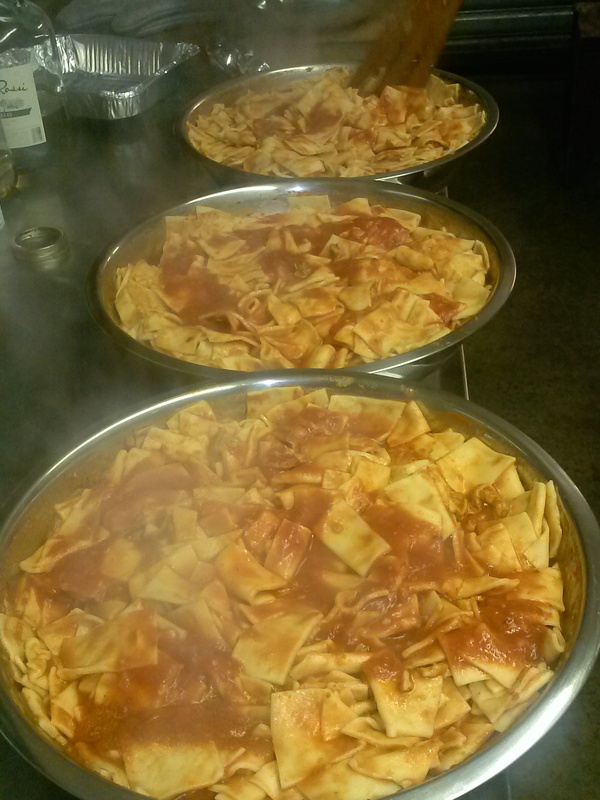 Raise the heat and continue to simmer until the water has evaporated and the pasta and sauce are well-combined. Remove from the heat and add the egg yolk-and-cheese mixture to the pasta, tossing quickly and vigorously until the pasta is fully coated. Sprinkle with additional grated cheese and salt and pepper to taste and serve immediately. Buon appetito!